The Portes du Soleil still remains a gem of a ski area; 230 lifts, 650kms of marked piste acres of off piste and all this just under 1 hour from Geneva Airport. Les Gets is situated on a col at 1200m; on one side the lifts link into Morzine while on the other side Mont Chery looms high above the village. There is talk of linking the back of Mont Chery in to the Espace Roc d’Enfer area and while some piste maps have the plans of the lifts showing nothing has yet materialised. Mont Chery offers wide open skiing on the south facing slopes and generally very quiet. Bouquetin is a severe black – steep enough to challenge even the most experience skiers; Chery Nord is a steep mogul run down to Col de l’Enrenaz – after a snowfall there is often acres of untracked snow on Mont Chery. Crossing the village of Les Gets from Mont Chery opens up Les Chevannes and Le Ranfolly. Les Chevannes is a collection of bars and restaurants over looking some wide open ski slopes; heading right in to the Ranfolly bowl accesses a series of long reds; but take the Rosta Chair lift up and two surprising blacks await Myrtilles and The Yeti. But if you bare right at the top of the chairlift then keep left this takes you sweeping down at pace to La Turche – which is the extreme western part of the ski area. From the top of the Ranfolly chair lift either off piste through the shrubs and trees, the Tetras red or the lovely Chouas blue over towards Chamossiere. A stop at the legendary hotdog and vin chaud hut is a must before jumping on to the Blanchots drag tow to access the Chamossiere Chair lift. At the top of the drag, take a deep breath – here is one of the Alps real secrets – The Chamossiere Bowl. On a powder day there is no better place to be! Start on The Creux which runs underneath the chairlift; graduate to Arbis the red which goes back to the hot dog stop. Some of the best off piste is available in the next bowl to the right of the chairlift as you go up; or at the top of the chair traverse along the ridge to the right staying above the red head west then you need to bare right before dropping back down steeply on to the red run. There are a couple of excellent lunch spots on Nyon – Chez Nanon is small, ideally you should book, very friendly. Otherwise the large restaurant on the actual plateau run by Pascal is superb with a great sun catching terrace. From Morzine there are 3 ways up into the Avoriaz sector of the Portes du Soleil – Super Morzine from the centre of Morzine is quick – a 6 man bubble lift followed by a fast 6 man chair to the top of the Super Morzine ridge. A ski down to Proclou – up the chairlift over the nursery slopes to the ridge that separates Avoriaz from Les Lindarets. Otherwise, take the A bus to Les Prodains and either jump on the large but old cable car which goes up to Avoriaz it’s self, or if your prepared to walk 100m, the fast chair lifts that take you right up to the top of the Haut Forts area which gives you the choice of runs to ski down. The third way up is via the M Bus and the Ardent bubble lift. This is the quietest way up and takes you right into the heart of Les Lindarets. 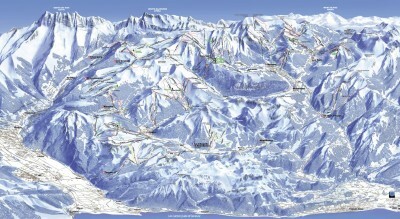 Avoriaz has basically 4 areas; Hauts Forts, Arare, Chavanette and Les Lindarets. The Haut Forts are all north facing ‘black’ runs – though the World Cup run isn’t really a black in the true sense of the word. Machon however is – steep bumpy and once you are in there is no backing out till the bottom – while steep it is wide and the bumps not as bad on the left (though steeper) as you ski down. Les Crozats is a special area- a freeride paradise- 1000 of off-piste – or cut off at 1700m and take the Machon chairlift up to do it again and again and again…. Arare is one of the more popular areas; basically a big wide blue run all the way back to Avoriaz – we recommend skiing to the left on the way down (race training piste) if open or the far right – thought this takes you right past the ‘Park’ with it’s huge jumps. Just after the park if you bare right you head over to the Chavanette bowl. Chavanette is about the highest skiing in the Portes du Soleil – a fabulous bowl served by 2 high speed chair lifts and 2 drag tows. It can get busy but the snow is always good. There are various ways out of the Chavanette bowl – take the Fornet Chairlift if you want to ski off piste down the Vallee de la Manche back to Morzine; the Chavanette drags then head ‘south’ to the top of the ‘Wall’ the famous black run between Avoriaz and Les Crosets / Champery. Alternatively jump on the triple chair that is locally known as the up and over – but get off at the top! This opens up the Lindarets valley. Alternatively ski out of the bottom of the Chanvette bowl back to Avoriaz and take the 8 man high speed chair lift through Avoriaz and to the top of the Prolays ridge where you can ski down to Les Lindarets. Les Lindarets is a great valley – tree lined skiing, wide open slopes, fast motorways – it has it all as well as some of the best lunch stops in the area if not the Alps. When the weather comes in head to the blues and reds as well as the Stash – a ‘green’ park in the woods on the way down to Lindarets. Otherwise head for Brocheaux and take the Mossette chairlift to ski Abacotine back to Les Lindarets – the story is that this run is named after the local liquor which was consumed with passion by both Swiss and French ski instructors when the Portes du Soleil / Mossette link was first opened – rumor has it that a few of the instructors were so taken by the drink that they didn’t make it back to Morzine that night! The red down to Brocheaux is a steep north facing bump run, but on the way down bare to the right and access the lower half of Les Drobounes a gorgeous off piste bowl. The are a couple of very good restaurants at Brocheaux. From Les Lindarets the Chaux Fleurie Chairlift accesses the Chatel / Linga area. From the top of the Chaux Fleurie – traverse hard left for a great off piste back down to Lindarets – but be careful not to stray too close to the cliffs towards the bottom. Alternatively bare right for the meadows – in good snow this is a fabulous off piste route down to Lindarets or for the brave carry of down to Ardent. Generally most skiers and boarders access Chatel from the Chaux Fleuri Chairlift from Les Lindarets. The Linga valley generally tends to have good snow. The runs down towards Plain Dranse are wide and open though the reds do get steep – keep left on the way down for the blue which isn’t that well sign posted. At Plain Dranse there are some great restaurants and beer stops – Babeths and her Vieux Chalet have become a firm if somewhat eccentric favourite. Carry on down the wide blue run to Pre la Joux for lifts heading over to Linga its self. Or stay around Plain Dranse – the Chaux des Roses chairlift has a few options – a steep black back to the base station, or lovely red off to the right which sweeps back down to Plain Dranse. Alternatively take the blue which traverses the side of the mountain heading over to Le Queyset (good coffee stop!). There are two chair lifts here – Cornebois heads back towards Plain Dranse, while the Combes heads over to Linga. From the top of Combes bare right as you get off the lift – try and keep as high as possible as you traverse – this opens up in to the not quite famous Happy Valley – a lovely off piste run which joins the main piste at Combes en Haut – an old mountain pasture farm stead. Alternatively from the top of Combes bare left and round the corner to Linga. Linga is a cold shady valley that drops 1000 m right down to Chatel – the snow is always good sometimes perhaps a little firm. The Linga chairlift back to the top has recently been upgraded to a super high-speed 6 man. At the top of Linga you may well see a traverse on your right as you look down the valley. Only when there is no avalanche risk should this be attempted. Those brave enough to make the traverse will find themselves in the off piste Eldorado of The Portes du Soleil – the Hidden Valley. Steep and deep spring to mind. Towards the bottom the track out is on the left and wonderfully pops out right by a drag tow. Skiing down to the bottom station you have two choices if you want to head over to Super Chatel; carry on down to the bottom and jump on the free ski bus which takes you into Chatel (make sure you stand on the right side of the road otherwise you’ll end up at Pre la Joux!) or pick up the fire road by keeping to the right on the way down – this will take you on a traverse through the nursery area and pop you out about 300m away from the Super Chatel bubble lift. Super Chatel is a wide open ski area right on the Swiss border. Most folk just slide straight on through Super Chatel on the way round the circuit – but they miss out – there is some good skiing and boarding here! First off take the Morclan chair lift (just in front of the bubble lift top station) – at the top you ‘ll notice the Barbossine black run – a wide steep bumpy bowl down to the Barbossine chair lift. This takes you up to Chaux Longe – from here you can access the Torgon area then further on to Chapelle d’Abondance. Dropping into the Torgon area you have two choices – the blue that contours down to the bottom of the bowl or the ferocious Torgon Wall – very steep, very narrow and some nasty trees to avoid! At the bottom of the bowl the chairlift on your right takes you up then a ski down to Torgon itself – lovely views over Lake Geneva – alternatively take the Combe T Barup and slip over in to the Conche bowl – only short but some great skiing here. A drag tow opens up the top of the Chapelle d’Abondance area – a couple of wide motorway runs through the trees await. Back to the top of Morclan bare south – the run can get quite bumpy but the bumps are generally soft – there is a blue road round as well.. to a drag tow that eventually takes you to the top of Morgins. The ski area at Morgins is split into two either side of the village. The south side that links to Super Chatel is best avoided unless the conditions are great. Once down in Morgins there are a couple of places for Lunch and or a beer that should not be missed – The Sport Café is excellent, good food and an exquisite pint! The north side of Morgins has some good fast carving runs back to the village; though really it is not worth going much past the Plan Joyeux drag tow. Once back up on the ridge – The views are fabulous – from Mont Blanc, round to the 4000m peaks surround Zermatt and on even to the Eiger and Monk above Wengen. La Truche is a lovely red run – serviced by a chair lift, the majority of the other lifts on this side are T bars – don’t let this put you off the runs are good wide open flat – perfect for carving or learning to carve. Head over to Champoussin and again you’ll be surprised by the variety of the terrain. Up to Point de l’Au and you have two choices – head over to les Crosets or the great Morgins off piste bowl – though the rumor is that this off piste bowl is about to be turned into a lift served piste – all good thing end sometimes! Though the new piste will be fabulous! Very few venture down to Champery – which is a shame the village is beautiful in a stunning location right underneath The Dents du Midi. A vast cable car runs out of Champery climbing 1000 vertical metres to Croix de Culet. From here a blue and red run descent quickly to Les Crosets. The Sundance used to be a good spot for lunch, though Chaux Palin half way down the Palin chair lift is reputed to be much better. The North facing slopes are more popular in Les Crosets – generally only take the Point de l’au chairlift if you want to access to Morgins off piste or if you are skiing the circuit and are heading over to Chamoussin. The Mossette chairlift rises to 2277m and offers access back to Avoriaz via Les Lindarets. From the top of the Mossette chairlift is perhaps one of the last truly secret off piste routes in the area (not now!) Again this should only be tempted when there is no avalanche risk and be prepared for some pushing – it’s worth it. Head north down towards Lindarets on the itinerary run; keep to the right and after 200m or so bare hard right to the top of a stunning cwm which leads down to Lac Vert. It’s steep but widens out towards the bottom. Keep to the left before the bottom of the lake to avoid pushing. Work your way north(ish) through a farm stead then on towards Lac de Chesery. From here you work you way down through the scrub – a bit of cowboy skiing; it then opens up to a couple of lovely fields which for some reason always have good snow. Pick up the road and push a little to En Tey – stop for a well earned beer then you are on the cross country track and a 15 minute push brings you in to Morgins. From Les Crosets head over to Planachaux – underneath the ‘Wall’ – Take the Ripaille double drag up – head right for the Wall chairlift and back in to Avoriaz or left for the glorious Grand Paradise down to Champery – this runs starts with wide open piste – stop at Ripaille for a coffee and cake – with one of the best views in the Alps – the run carries on down to the valley floor mainly along a summer road – while not terribly exciting the views are awesome! This guide just scratched the surface of the Portes du Soleil – there are plenty of runs and off piste we haven’t touched upon – The Pepsi Max, The Swiss Couloirs but we hope this helps give you a flavour of what awaits you when you book your next holiday to Morzine and The Portes du Soleil.